Minnesotans are all about the Minnesota pride and representing our state. We love to support homegrown businesses and fellow Minnesotans. Check out these seven small businesses that have started and grown in Minnesota. From apparel to personal care, these businesses have a variety of products that come with a passion behind them. The Midbest Hat by Midwest Made Apparel is perfect accessory for enthusiasts of the Midwest. It’s available in two colors. Midwest Made Apparel is a lifestyle clothing brand based out of the Twin Cities. It is run by a pair of Minnesota-natives who love adventure and everything about their home state. Their clothing and accessories have a sleek and simplistic feel and are inspired by the owners memories and adventures across the state, many of which feature midwest nature, scenery, and culture. Their short and long sleeve tees, totes, and hats are suitable for both men and women that want to sport their wanderlust and love for the outdoors. This “Outside is the best side” tee by Nomad in the North is great for nature-lovers who dig 50s and 60s inspired-designs. The design is also available on totes, phones cases, and other tee styles. Nomad in the North is run by a family of four with a passion for camping in Minnesota. They blog about their travels and love for the midwest and make clothing and accessories inspired by all things camping and nature. Some of their vibrant and bold designs feature feathers and flowers while others feature witty quotes such as “I like big hikes and I cannot lie.” They have clothing for nature enthusiasts young and old as well as totes and phone cases. This Lake Livin’ patch by MNTD is perfect for fans of Minnesota summers spent on boats or at the cabin. MNTD (or Minted in Minnesota) is a clothing company that makes apparel that represents the Minnesota experience and are designed and made in Minnesota. Run by a native, their unisex sweatshirts, tees, hats, patches, and artwork feature bold designs in muted colors inspired by nature and Minnesota lingo. They also have tees and tanks with inspiring, funny quotes like this “I Got This” tee that are all Minnesota-made. OK, I had to put this in here. Courageous Creativity is all about embracing your true introvert and being comfortable with who you are. Their apparel is designed to give the wearer an inner-boost to be who they are unapologetically and accomplish their goals with vigor. They have bright and colorful leggings and tops that feature vibrant and fun designs. 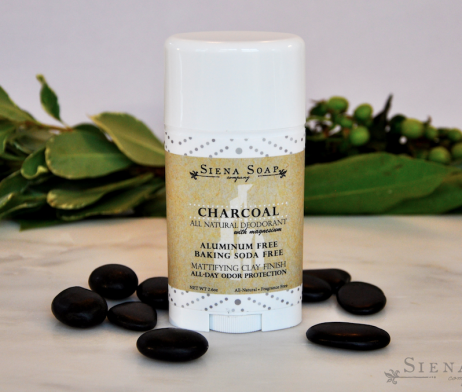 The Charcoal Deodorant by Siena Soap Company is made with charcoal and magnesium and scented with 11 essential oils. It works hard to keep you odor-free all day long. Siena Soap Company is an all-natural handmade artisan skincare company, specializing in small-batch soaps and other personal-care products. It is run by a mother-daughter team from Minnesota who make elegant, beautiful products. Excelcior Candle Co. candles are available in 6 oz. tins and 11 oz. glass jars. Lake Superior Mist is perfect for Minnesotans and is reminiscent of sitting by the lake. It smells of sunshine, Lake Superior, and grey pebble beaches. Excelcior Candle Co. makes 100% soy candles made with essential oils. They believe that a great fragrance can make everyday moments feel extraordinary. Their candles are made in small batches and with high-quality waxes and oils. Every candle is environmentally-friendly and made by hand from start to finish in St. Paul. The Agate and Mother of Pearl bracelet features bright orange stones and a cute feather charm. Mother of pearl is meant to shield negativity and offer protection. Karma Stacks sells handmade jewelry that aim to ignite compassion, peace, and healing. Each piece is made with high-quality stones and hopes to remind its wearer of self-love and positivity. Their jewelry pieces are ornate and delicate, featuring brightly colored stones and charms. Each piece is 100% handmade by the founder. So whether you’re shopping for a Minnesota-made gift for yourself or a friend, these seven business have got you covered. Each of these shops shows a dedication to their mission and matches it with beautifully crafted products, straight out of the Midwest.